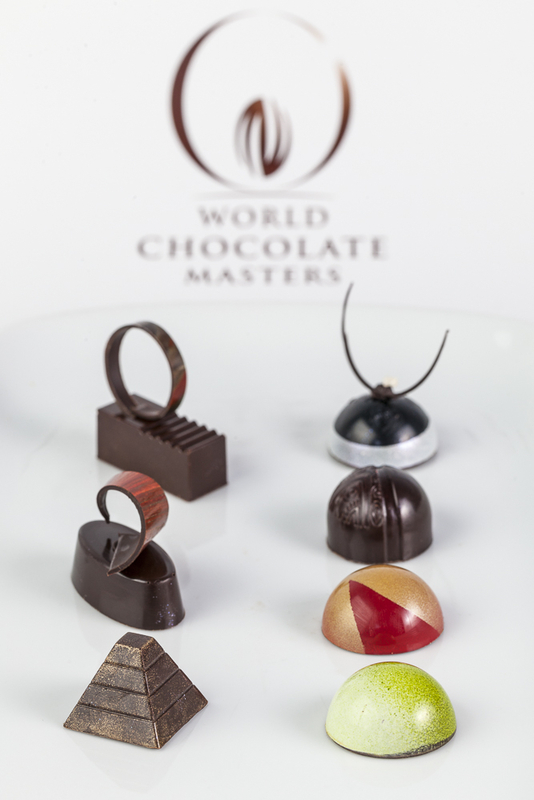 Succulent Chocolates and Sweets-World Chocolate Masters 2013 Best Molded Bonbon – World Chocolate Masters. 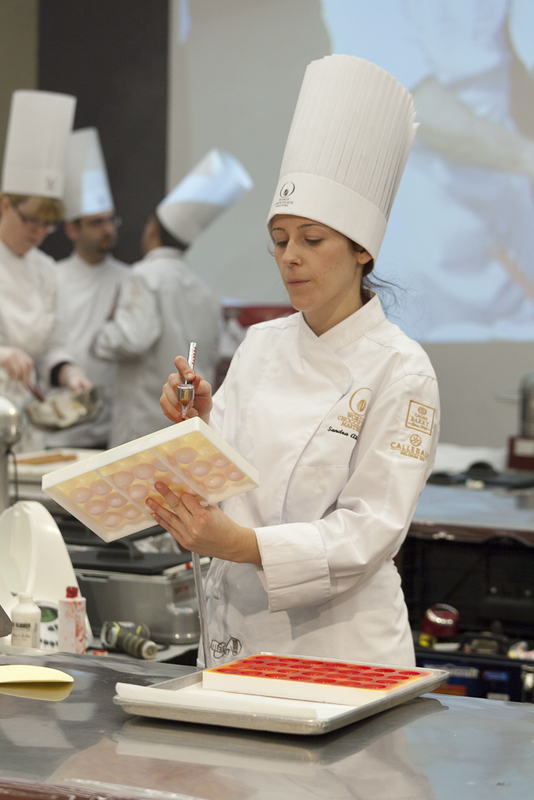 Sandra Abballe, a Vaughan native, was selected as one of seven participants to competed in the prestigious World Chocolate Masters (Canadian Pre-selections) held at Humber College on January 20,2013. 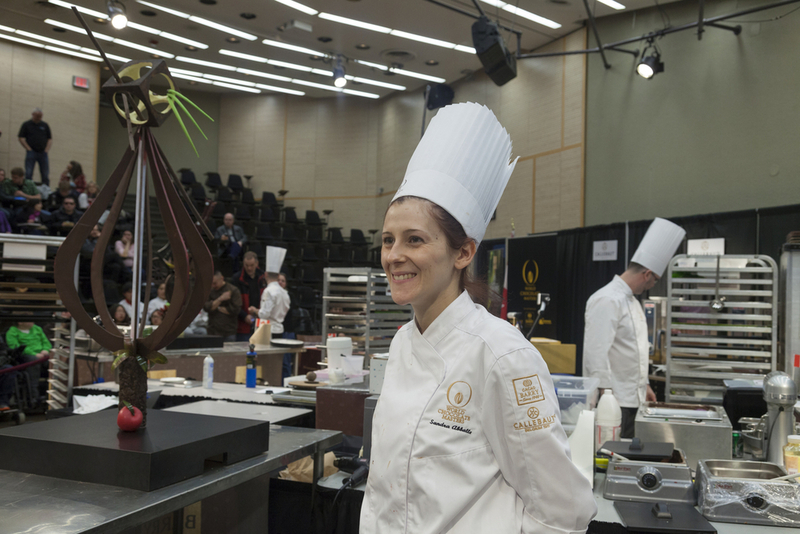 Contestants battled it out for the honour to represent Canada at the World Chocolate Masters International competition where eighteen countries from around the world will come together in Paris this November. The event was organised by Cacao Barry®,Callebaut®and Carma® whom are some of the largest and best chocolate producers in the world. The World Chocolate Masters is the only international bi-annual competition that is solely dedicated to the art of chocolate. The contestants were required to create one artistic chocolate sculpture, one moulded bon bon, one pastry, and, one chocolate dessert. 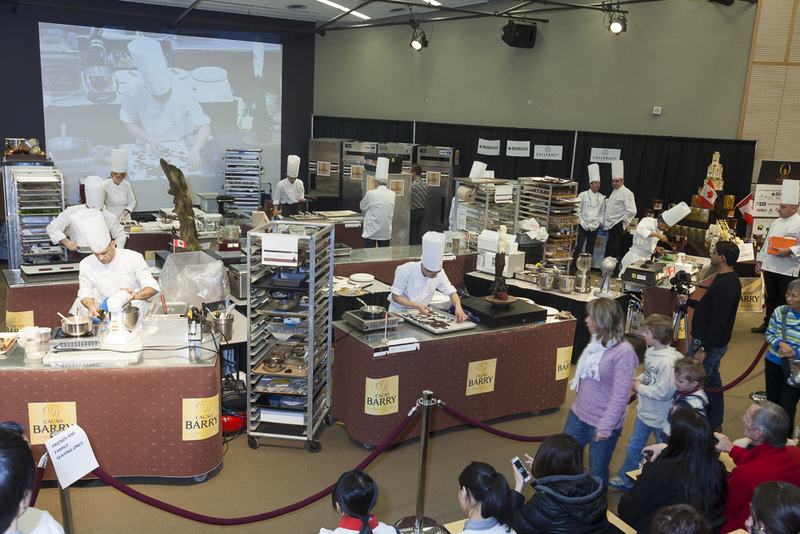 This year, for a Canadian culinary twist, competitors were required to reinvent a Classic Canadian Recipe titled “Tarte au Sucre” (sugar tart). The theme of this year’s one-day competition, both nationally and internationally, was “The Architecture of Taste”. In short, the competitors’ needed to create a brand new vision for the architecture of taste, which includes texture, tastes, and their imaginations; however, chocolate was to be used throughout all their culinary creations. Sandra has been training for months to prepare for this intense nine-hour competition. Her hard work paid off as she was awarded first place in the category of “Canada’s Best Molded Bon Bon”. Sandra’s hand crafted creation, titled “The Crunchy Apple”, is composed of freshly diced and caramelized apples combined with chopped oven-roasted peanuts. The crunchy layer of the Bon Bon is paired with a creamy salted peanut butter ganache. It was not only the perfect balance between texture and flavour that made this bon bon a winner, but it was also its decorative shiny shell that helped set it aside from the rest of the competition. 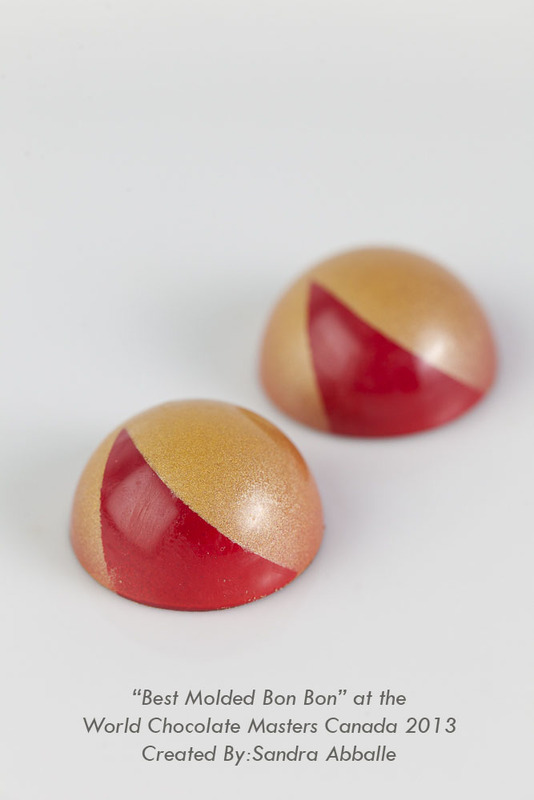 The lustrous shine of each bon bon is achieved from the expertise of the chocolatier, as they bring the chocolate to the perfect temperature for casting. Each chocolate mold is hand sprayed with three different cocoa butter colours for the bon bon to achieve their colourful depth. Since a young age Sandra knew her hands were meant to be in chocolate. Growing up in an Italian home, food was always the centrepiece of every family gathering. After completing her Bachelor’s of Technology in Graphic Communications Management, Sandra decided to pursue the profession she’s always dreamed of. 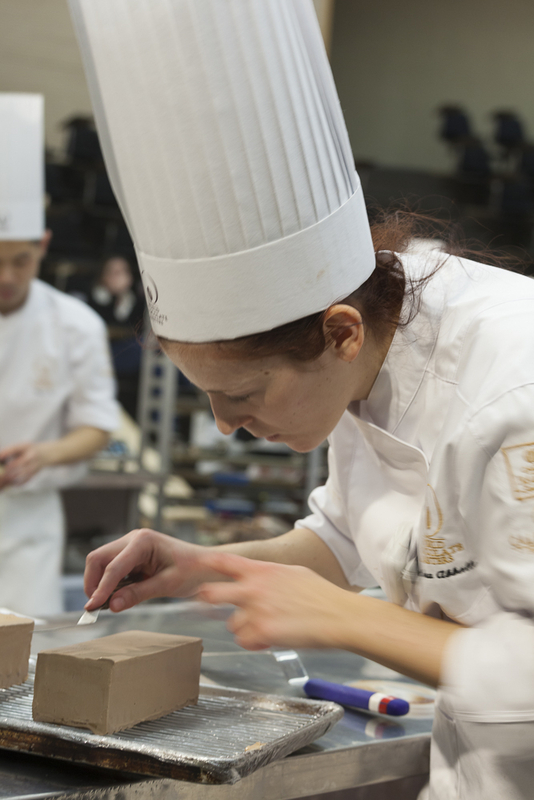 She attended the acclaimed French Pastry School in Chicago, IL, where she studied under master pastry chefs such as Jacquy Pfeiffer and Sébastien Canonne. Sandra is currently working under the direction of Chef Joseph Montinaro at Dolcini by Joseph located in Kleinberg, Ontario. She just recently opened Succulent Chocolates and Sweets, where she will be expanding on a full line of chocolate bon bons and confections. These items will be available for sale high-end food stores throughout the Toronto Area or directly through email.